Real Madrid made his return to La Liga in 2014 with a 3-0 home win against Celta Vigo, but despite the expressive result, it was far from being an easy game for the Merengues. Benzema scored the first goal deep in the second half, followed by a Cristiano Ronaldo brace, which has allowed him to reach his 400th career goal. The Portuguese star dedicated his goals to Eusébio da Silva Ferreira, who passed away this past Sunday. Real Madrid knew that it was forbidden to drop any point this Monday night, especially now that we're just one week away from an Atletico Madrid vs Barcelona clash in La Liga. With that in mind, one would expect for the Merengues to charge against Celta de Vigo right from the start and easily impose their law at the Santiago Bernabéu. That's not what happened though, despite the deceiving 3-0 final result with which both teams left the pitch at the end of the game. The Merengues seemed rusty throughout most of the game and until the opener got scored by Benzema in the 67th minute, it had been the visitors who created the best chances to score. Fortunately, Celta de Vigo forwards were also going through an uninspired night and Real Madrid made them pay later in the game, when Cristiano Ronaldo finally sealed the deal with a brace that also marked his 400th career goal. As expected, the 28-year old forward dedicated the two goals to the Portuguese legend Eusébio, who died last Sunday and who was regarded by many as one of the best football players of all-time. Ancelotti made a few changes to the team after last Thursday's friendly game against PSG. Marcelo, Carvajal and Pepe joined Sergio Ramos to form the defensive back line, while Modric and Isco came on to partner with Xabi Alonso in midfield. Upfront, Morata and Jesé Rodríguez stepped out so that Angel Di María and Benzema could also make their return to the line-up and by doing that, become Cristiano Ronaldo's partners in crime at the Merengues attack. Gareth Bale started the game on the bench after having struggled with a small injury over the past days, but would came on later in the 2nd half. The first half didn't bring us any goals at all, but the truth is that if there was any side deserving to be in front, that side would have to be Celta. Ancelotti was forced to make changes at half-time, replacing Xabi Alonso for Illarramendi, after the former Liverpool midfielder has allegedly picked up a slight injury. The game wouldn't change much until more changes were induced into the game though and that only happened in the 61st and 64th minute of the match, when Jesé Rodríguez came on to replace Isco's and Di María got substituted by Gareth Bale. 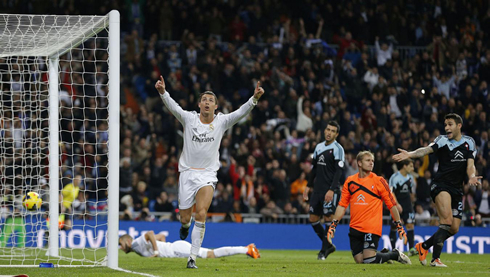 Real Madrid sunddenly managed to improve their game and got to breach into Celta de Vigo's fortified defense line. The opener arrived in the 67th minute, when Sergio Ramos decided to switch sides with a long pass, aiming for Carvajal near the right wing. The Spanish right-back found Jesé with a cross to the far post and the 20-year old forward didn't tremble when he took on a defender and sent a low pass to Benzema in the center. The Frenchman didn't have much space as he was already being guarded by a couple defenders, but with a nifty touch he made the ball go past Yoel's reach and scored the first for the hosts. The second goal didn't come right away, as it only got scored already inside the last 10 minutes of the game. Once again, Carvajal went down the right wing to put a cross into Celta de Vigo's box and this time, Benzema failed to reach out to it, allowing for Cristiano Ronaldo to come from behind and slot it in without much trouble. 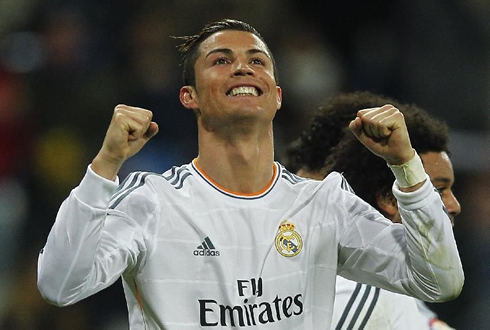 The Portuguese forward wasn't performing very well, but still, he found a way to help the Merengues securing the victory. It wouldn't be all for Ronaldo though, since the Portuguese would still complete his brace and reach his 400th career goal (accounting for official club matches, as well as official and friendlies for the Portuguese National Team). Gareth Bale showed off his sprinting capabilities on the right wing, left a defender behind him and assisted Cristiano Ronaldo for another easy finish. That's the 29th goal that Ronaldo scores this season (20 in La Liga) and he is once again the top scorer in the Spanish League, with 1 goal more than Atletico Madrid's Diego Costa (19), and 8 more than Real Sociedad's Griezmann (12). A final note to mark again Eusébio's death that occurred this past Sunday as well as Cristiano Ronaldo's gesture to dedicate his two goals to the Portuguese "Black Panther". 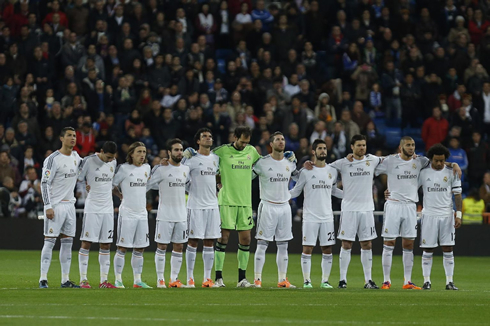 The Santiago Bernabéu has also respected 1 minute of silence before the kickoff of the game, in honor of the former Portuguese player. 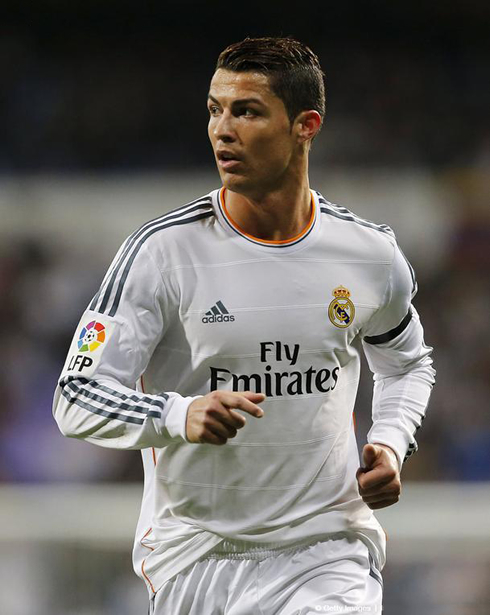 Cristiano Ronaldo next game for Real Madrid will be against Osasuna, for the Copa del Rey first leg (January 9, 2014). You can watch Juventus live stream, Real Madrid vs Osasuna, Barcelona vs Getafe, Sunderland vs Manchester United and Tottenham vs Crystal Palace, all matches provided from our football streaming section.